You can use our Jacobs Ladder, Short Ribs or Dinosaur Bones for this recipe. Allow plenty of time (at least 6-7 hours) for this to cook as it's one of those dishes which can't be rushed. You'll know when it's ready when you can slide the meat off the bone. Put all the ingredients, except the beef, into a saucepan and bring to the boil. Then simmer gently for 10 minutes. Allow to cool. Preheat the oven to 130 degrees C. Lay the ribs in a large roasting dish and brush them with the sticky sauce. Cook for 6 - 7 hours, brushing and basting regularly with the sauce until everything starts to melt and fall off the bone. Serve with rice and some fresh greens. This entry was posted in on 1st December 2014 by longhorn. This is one of our favourite dishes. Not only does it taste delicious, it’s also really quick and easy to prepare. The flavours get better and better the longer it cooks. Don’t worry you don’t need a proper tagine, I use a Le Crueset casserole dish with a fitted lid. Preheat the oven to 150°C/300°F. Using a large casserole (which has a fitted lid) heat the oil and brown the beef well. Add the spices, salt and pepper and cook for a minute. Then add the onion and fry everything together for another couple of minutes. Then add the orange zest, honey and prunes and cover with cold water. Bring it slowly to the boil, then add the almonds and stir well. Put the lid on and put it in the oven for two and a half hours. Check occasionally, stir and top up with water if necessary. Serve with cous cous, rice or mashed potatoes, scatter with chopped coriander. This entry was posted in on 27th November 2014 by longhorn. With Christmas just six weeks away and mindful of the fact that we dry age all our beef on the hook for five weeks, we are in full swing making plans this week in readiness for your Festive Orders. 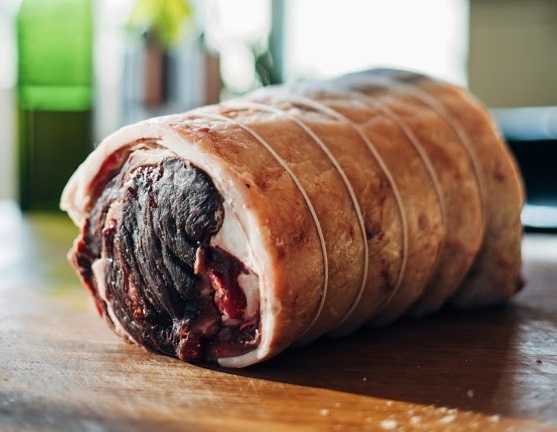 As well as the classic Forerib and Sirloin roasting joints, which are true show-stoppers when they're presented at the table, there is Fillet, Rolled Sirloin and Topside. And don't forget all the pre-Christmas preparation you can do by making your scrumptious beef casseroles now and freezing them until they're needed! We also reckon our Christmas Hampers, which include a wonderful selection of beef and accompanying goodies make a fabulous gift for foodie friends and family. Happy shopping! This entry was posted in on 10th November 2014 by longhorn. Sitting down to write this edition of our newsletter made us realise what a busy few months we've had and helps to explain why you've not heard from us for a while. Shrewsbury and Ludlow Food Festivals have been significant events over the summer. Shrewsbury was bigger and better than last year, which was a huge achievement with much credit going to the organisers, Beth Heath and Andy Richardson. We had fabulous pitches for the hot food and the chilled beef counters and our wonderful cow and calf are probably the most photographed in the county. Ludlow really stretched us, but for all the right reasons, as it takes place over three days and this year we were showcasing roast beef rolls and pulled beef rolls/wraps on our hot food stand as well as having the chilled beef counter. Our Great Berwick team worked tirelessly thoughout. Special mention must, without a doubt, go to Sarah without whom all this couldn't be possible. Her behind the scenes role in the Cold Room, alongside Martin our Butcher, is heroic. The forage wagon, combine harvester and baler have all been incredibly busy too this year. We've just baled the last of the silage, which means we're pretty close to having the Harvest in safe and sound. The sheds are full to bursting which bodes well for what ever the winter throws at us. Organic grain buyers and merchants are now justifiably keen to get their hands on our linseed, barley and oats. The Shrewsbury Flower Show, at the end of August, has in previous years, triggered some to start thinking about Christmas. This year was top trumped though by an order we received in June! We're very impressed by this forward planning and leads us on to give a gentle prompt to those who would like Beef for Christmas. Please do get in touch in plenty of time!! In the meantime it's business as usual and we have good supplies of joints/cuts/steaks in stock. We hope you enjoy the Autumn; those wonderfully fresh and misty mornings and the long shadows in the afternoon sun certainly help lift the spirit! This entry was posted in on 1st October 2014 by longhorn. Seemingly today is the first ever Buy British Day....but shouldn't EVERY DAY be Buy British Day? Think British, Be Proud to be British, Buy British! Be it bicycles, lighting, footwear ... oh yes what about your Grocery Shopping basket? Look no further for your Great British Beef. We are so proud of our Longhorn Beef and we want to share it with as many appreciators of good food as possible. This entry was posted in on 3rd September 2014 by longhorn. If you're reading this the chances are you believe in eating good food and great beef; whether it's organic, grass fed, properly hung, Longhorn, local or with a guaranteed provenance. Rest assured we continue to work within these parameters and strive to offer you the finest Longhorn beef. The whole process is quite a journey, but it's worth it and we make no compromises when it comes to quality. Sometimes this means there may be a short waiting time for certain steaks or roasting joints, so, if you have specific requirements, do please let us know in good time. We will, of course, do our utmost to deliver. Food Festivals provide us, and other artisan producers, with a fabulous stage from which to present our products to a wider audience. We very much enjoyed the Ludlow Spring Festival in April and Shrewsbury Food Festival is fast approaching. It promises to be the ultimate culinary extravaganza! If you're free and you fancy a day out, we look forward to seeing you there! Also, please see below for details of our Open Day on Sunday 13th July. Enjoy your summer and here's to further enriching your food experience. Who needs artificial fertilizers when we can grow a crop of grass and clover like this? This is a first cut of silage (a second and, if we're lucky, a third) will follow. The grass is mown when it's dry and has had some sun on it. It's then allowed to wilt before it's picked up with the forage wagon and transported back to the yard. There we fill a concrete bunker, level, roll and cover it in plastic sheets and leave to 'pickle' into sweet smelling, nutritious winter forage. 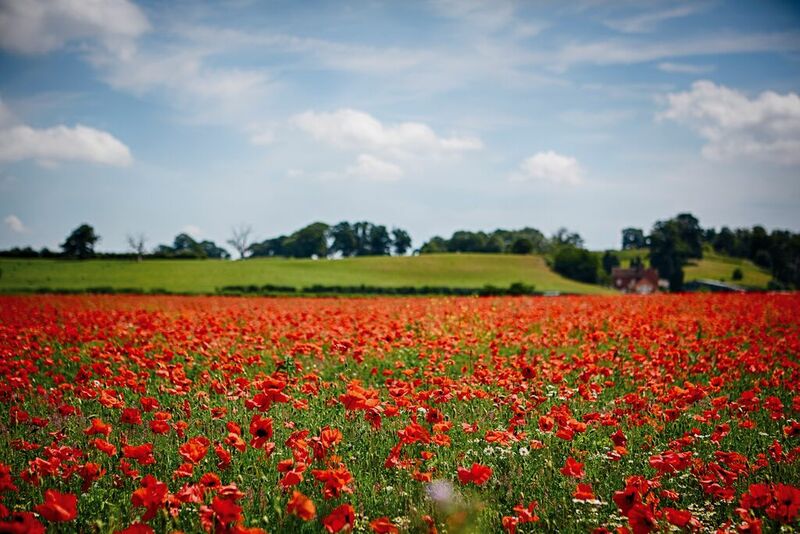 Our organic linseed is now flowering (pale blue) and the field adjacent is just turning crimson with poppies. The heavy showers, thunder, lightning and hail stones we've had over the last few days has prevented us from taking some good photos, but if you like, click on the Facebook or Twitter buttons below to keep track of what's happening here at Berwick on a more regular basis. We are absolutely delighted to be supplying Chris Burt, Executive Director Chef at the Peach Tree http://www.thepeachtree.co.uk with our Longhorn Beef. He is a firm believer in supporting local producers and his creative and imaginative presentation of food is inspired. We are very much looking forward to continuing to work with Chris and his team. For local customers, please note that as well as being open every Friday (12 til 6pm) on the Farm, we are also going to have a regular pitch at the Shrewsbury Farmers' Market which takes place (come rain or shine) on the 1st Friday of each Month. This entry was posted in on 1st June 2014 by longhorn. Did you know that it's British Pie Week? In order to mark the occasion we are offering our delicious 'individual cook from frozen' pies for a reduced price of £25.00 for a box of 10. The normal price is £30.00. Choose from Steak & Ale, Steak & Stilton, Steak & Kidney, Minced Beef & Onion ... or a Mixed Carton. The offer is only open until midnight on Monday 10th March, so hurry whilst stocks last! This entry was posted in on 17th March 2014 by longhorn. This entry was posted in on 1st March 2014 by longhorn. Stick to the grass-fed beef, not the grain-fed meat that dominates the supermarkets, and the health benefits multiply. Organic, grass-fed beef contains a complete protein profile – and it's much tastier than grain-fed beef. Thanks to our celebrated collection of native breeds and abundant green pastures, Britain effortlessly picks up the trophy for the world's best tasting beef. So why settle for slack-fleshed, vapid supermarket stuff? This grain-fed produce comes from fast-growing, foreign breeds fattened up on cereals, and won't eat that well, because it is rarely aged, more usually just dispatched directly from abattoir to store. It can't match the taste and succulence of darker, dry-aged beef from heritage breed cattle that grow slowly on a grassy diet. It also won't have that light cover of flavoursome, golden-white fat. One of the most nutritious foods, beef has appetite-sating high-quality protein, which has all the essential amino acids needed (isoleucine, leucine, lysine, methionine, phenylalanine, threonine, tryptophan, valine and more) to build muscle and bone. 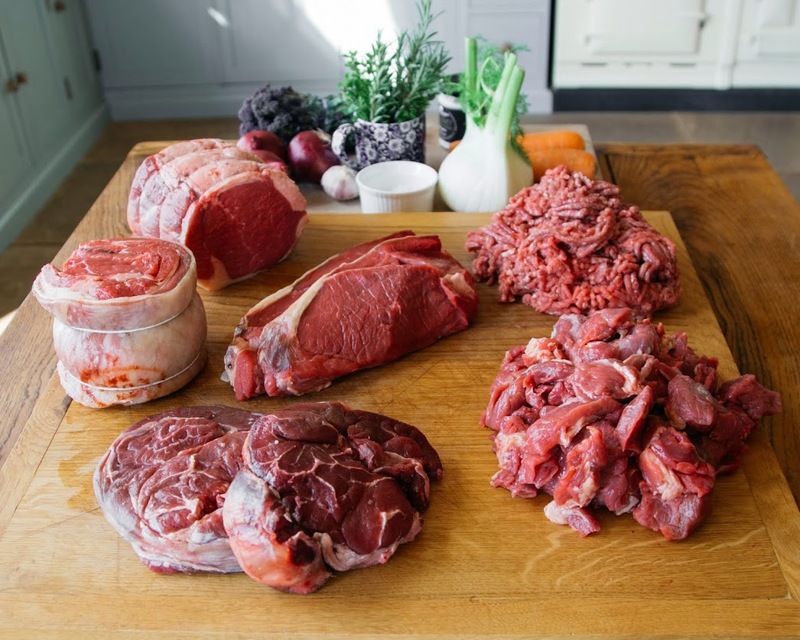 Beef is a great source of B vitamins (vital for brain function), and the most absorbable form of iron (called haem iron), which builds red blood cells and gives you energy. Its rich store of zinc supports the immune system. Beef contains both saturated and monounsaturated fat (thought to be protective against heart disease). Contrary to the prevalent dogma, it's emerging that there is no good evidence to support the notion that saturated fat is harmful. 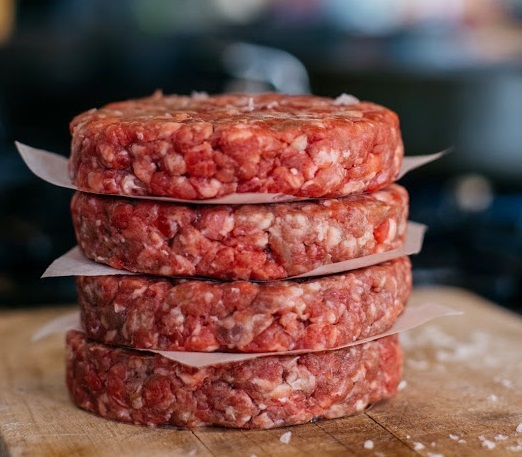 Beef from grass-fed cattle is a great source of omega 3 fatty acids, and conjugated linoleic acid, which some studies show reduces the risk of cancer, obesity, diabetes and some immune system disorders. Buy pastured beef from a craft butcher who has hung the meat to dry-age it and allow its natural flavour to develop. This entry was posted in on 18th December 2013 by longhorn.